The kipping pull-up is an exercised popularized by Crossfit that involves using the momentum of your body to help drive your body upwards to the pull up position. One advantage of kipping pull ups over strict pull ups is you can do more of them, giving yourself a longer workout that gets your heart rate up and increases the stress on your system so you can get stronger. The other thing to note about kipping pull ups is they are just another way of using the body as a unit to accomplish a task in the most efficient way possible. That’s what true fitness is all about. The skill of doing kipping pull ups can be valuable in real-world situations where you need to pull yourself up without tiring out your arm and back muscles too much, whether you’re running a course or just trying to traverse obstacles to get somewhere quickly. Unless you’re 5ft tall or so, the standard 8ft ceiling in an apartment isn’t going to give you enough room for kipping pullups. Find a way to do them outside or in a taller room. A wall-mounted version should be at least 30″ from the wall to give you room to swing your legs. 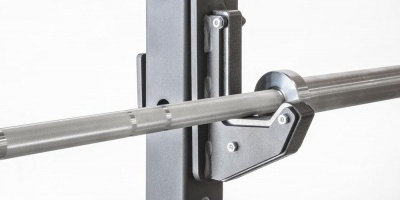 Good brackets and hardware are also necessary because of the force you’re going to be putting on the bar on each rep.
A ceiling-mounted pull up bar attaches to ceiling joists. You want plenty of room for your head above the bar without worrying about bonking the ceiling, so you might want at least 18″ to feel comfortable, but you can get away with less if need be. Technically this type of system may be spaced the right width to go across two joists, but don’t do that. Joists are not made to take that kind of load from underneath. A much better way is to get a bunch of lag screws and screw a 2×6 board across 4 joists, spreading the load. Then screw your pull up bar into the 2×6. This way the ceiling isn’t going to come down on you if you get a little too aggressive. Another consideration in mounting a ceiling pull up bar is most ceilings in residential apartments are only 8ft tall, which gives you no room for kipping once you have mounted it 12″ or more below the ceiling. Another type of setup is a floor mounted unit. You will probably need to either weigh it down with weight plates, if there are posts on the unit to take the plates, or bolt it to the floor. Kipping generates a lot of lateral force, and you need something stable. A rig is a Crossfit invention that is made for group workouts, with several pull up bars and barbell racks. It looks like a multi-station power rack. These can be very sturdy, especially if the steel tubing is at least 2″x3″. 2″x2″ is passable but may wobble a bit, especially with multiple people doing kipping pull ups. Hollow steel pipes are usually used for the bar rather than a solid steel bar. A pipe is plenty strong enough. The other reason is holes need to be drilled into the pipe to mount it and keep it from rotating, and that requires some serious drilling if it’s solid steel. As far as the thickness of the pipe, 1″ and 1.25″ are popular. A lot of men like either 1.25″ or 1″, while women primarily prefer 1″ because of their smaller hands. Most people don’t want to be going thicker than 1.25″ because the grip starts getting more difficult. That would be okay for strict pullups, but for kipping you need to be able to get your fingers around the bar easily. Powder coating is the most popular finish on kipping pull up bars. It’s a good balance between giving a good enough grip and not tearing up your hands too much. Some power racks have a knurled pull up bar, and that will tear your hands up really quick if you try kipping on it. On the other end of the spectrum, a smooth painted bar is too slippery and you may end up flat on your back when your hands get sweaty. An unfinished steel galvanized pipe from Home Depot can be okay, and if you sand it down with steel wool you will get a smoother finish that could be perfect.